CASTRIES, St Lucia, Feb 28 2012 (IPS) - As developing countries urgently seek new sources of financing to cope with problems linked to climate change, delegates from the nine-nation Organisation of Eastern Caribbean States (OECS) met here last week to evaluate potential funds and outline a more concrete vision of what is required for the subregion. “The workshop sought to raise awareness and share experiences on instruments and best practices related to financing adaptation and sustainable energy, and to generate feedback on planned future action and partnerships,” Keith Nichols, head of the Sustainable Development Division at the St. Lucia-based OECS Secretariat, told IPS. 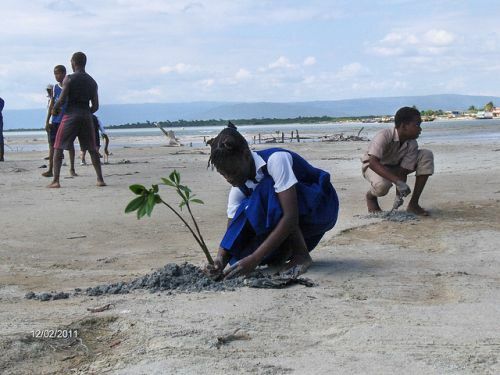 Supported by the World Bank, it explored carbon financing opportunities to enhance the ability of Small Island Developing States (SIDS) such as those of the OECS to respond to challenges like sea level rise and coastal erosion. “The pursuit of a green growth agenda which promotes co-benefits in climate adaptation and mitigation, and which supports scaling-up of renewable energy and other economic resilience-building programmes, served as the vision on which this workshop was initiated,” Nichols added. Delegates discussed case studies on sustainable land management for climate variability and climate change; adaptation challenges in the coastal and marine sectors; climate change adaptation and disaster risk reduction in the OECS; as well as an adaptation finance case study from the Pacific region. The OECS comprises Antigua and Barbuda, Dominica, Grenada, St. Lucia, St. Vincent and the Grenadines, Montserrat, St. Kitts-Nevis, Anguilla and the British Virgin Islands. TRINIDAD: Training the Leaders of "Generation Climate"
Chrispin D’Auvergne, chief sustainable development officer for St. Lucia, believes that as a grouping, the OECS can better negotiate access to global climate funding – for which there is plenty of competition among developing nations. “Recently there was an international fund launched, the Green Climate Fund, but I believe there will be a lot of demand on that fund. There is also an existing Adaptation Fund, but again I think the demand for that fund will outstrip the supply,” he said. Approved at a U.N. conference in South Africa, the Green Climate Fund is supposed to raise 100 billion dollars a year from rich nations by 2020 for climate adaptation in poorer countries. “There is also bilateral and multilateral sources available through the international development banks for countries interested,” D’Auvergne said. “There is loan financing. But for many developing countries, the argument is that we are not the cause of this, so ideally we are not supposed to be borrowing money to finance climate change adaptation needs,” he added. D’Auvergne argues that “one of the things we have to do as Small Island States is press these developed countries to live up to those pledges and some of them have started doing so. “But also for our part we really have to try to crystallise exactly what we are seeking in relation to climate change funding, because it’s one thing to go out and say we need funding to adapt to climate change, but it’s another thing to say ‘I have put together a package of what we need’ and say to our bilateral and multilateral sources ‘this is it’, but if it is a generic request we are less likely to receive assistance,” he said. There was a general consensus that the approach to climate resilience and low carbon development should be embedded into national/sectoral, regional and private sector development plans, and that there is need for additional investment in capacity and public education so that communities shift from “understanding” the key issues to “ownership”. The main obstacles remain the lack of needed financing, the absence and inaccessibility of data, human resources and mapping capabilities, and a lack of political will and cooperation amongst stakeholders. Nichols said that among the recommendations outlined to deal with financing climate change adaptation and sustainable energy were the need to link climate change adaptation with disaster risk management and to engage the private sector, particularly insurance companies. The Clean Development Mechanism (CDM), as envisioned under the now- expired Kyoto Protocol, in which richer countries pay poorer countries to reduce emissions on their behalf, is one possible solution. But the workshop noted that while the CDM has established credibility as a market mechanism in terms of size, value and types of participants, “it has limitations for sustainable development and GHG (greenhouse gases) reductions in small island states”. Serious doubts have also been raised about whether many of the CDM projects meet the requirement that they be “additional” – in other words, that the net reduction of greenhouse gas emissions is greater than the cuts that would occur anyway without the initiative. Other instruments, such as Green NAMA bonds (short for Nationally Appropriate Mitigation Actions) and the Green Climate Fund, which encourage upfront financing for low carbon development objectives, are also promising to encourage private sector participation. The workshop was the second initiative by OECS this month on environmental issues. The first dealt with efforts to strenthen the management framework for ocean resources so as “to ensure their maximum contribution to economic development goals of OECS member states”. The St. Lucia-based grouping said that the sustainable development of ocean resources represents a key aspect of the economic development of the OECS region, in conformity with best international practices, the 1982 United Nations Convention on the Law of the Sea (UNCLOS) and other related instruments. “OECS states see a need to consider the possibilities for other resources within OECS waters such as the implications of the recently endorsed CARICOM Common Fisheries Policy, marine transportation tourism, and the exploration for petroleum products. “The current OECS ocean governance programme is geared towards enabling the OECS Secretariat to create an institutional framework for regional cooperation in trans-boundary oceans management; strengthening national and regional capacities for the development and implementation of ocean law and policy within the framework of sub-regional cooperation,” the Secretariat added.